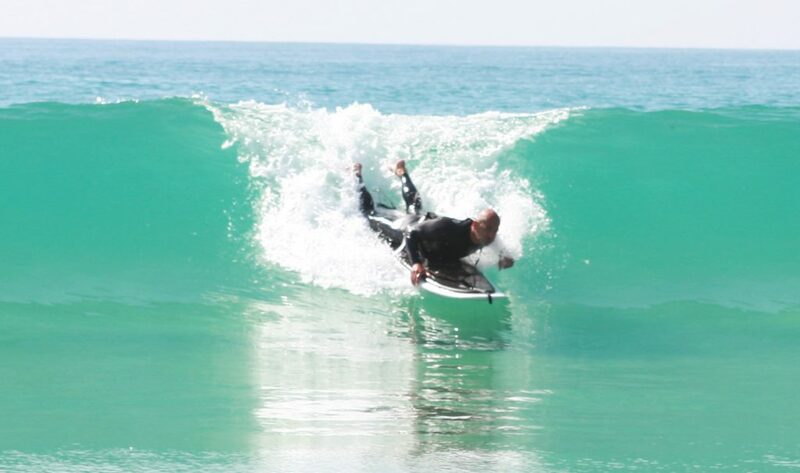 Classical surfing consists of gliding down a wave that breaks in many positions: standing, sitting, kneeling or lying down. 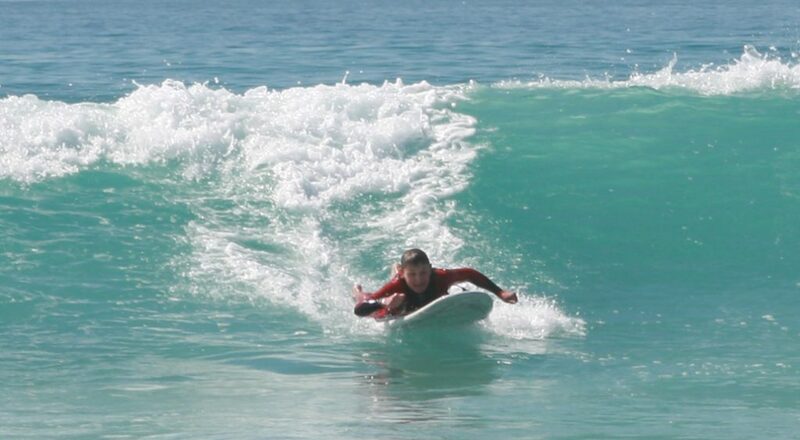 Many sports are derived from it: windsurfing, kayaking, paddle-surfing, tow-in surfing, and many more. 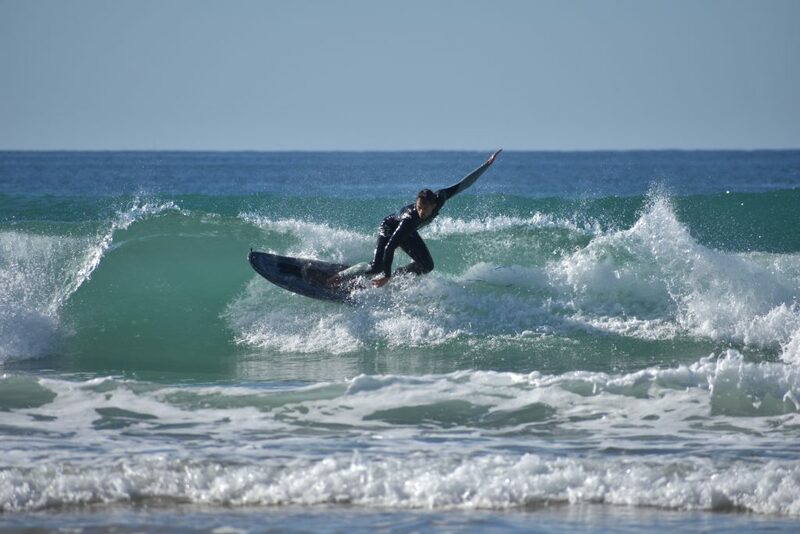 All variants of surfing are pleasing for the mind – alternating effort with pleasure, generating emotions, teaching respect for nature, dealing with frustration, learning patience, strengthening social ties – and for the body – mobilizing many members alternating strength, cardio, flexibility, balance and agility. 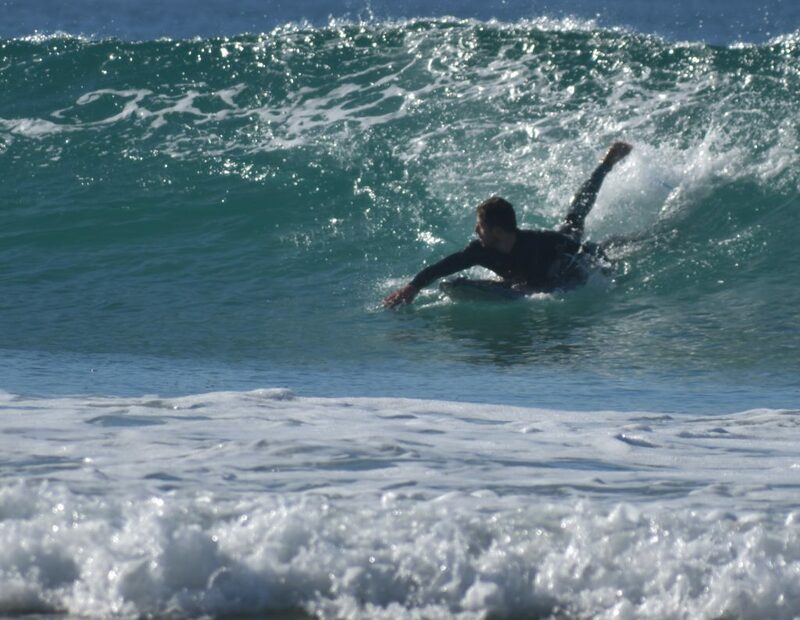 The first difficulty of surfing is synchronization with waves: surfers have to reach the right place where waves begin to break and quickly paddle with their arms to take wave’s speed. 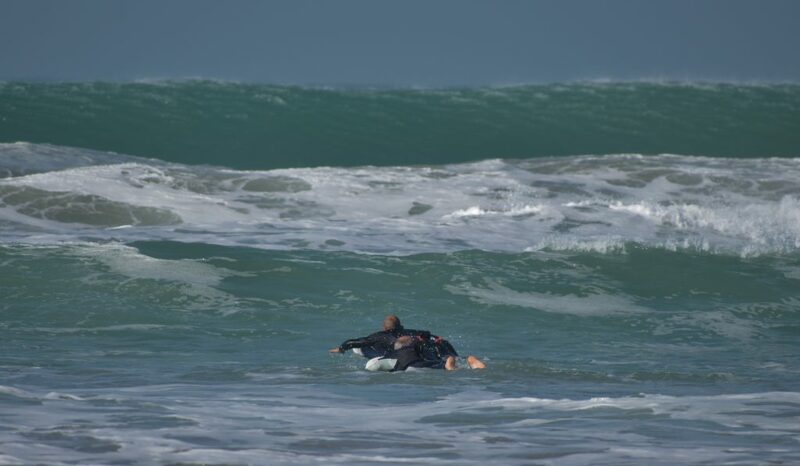 The second difficulty of surfing is to stay out of waves’ breaking zone while staying inside waves’ slope. 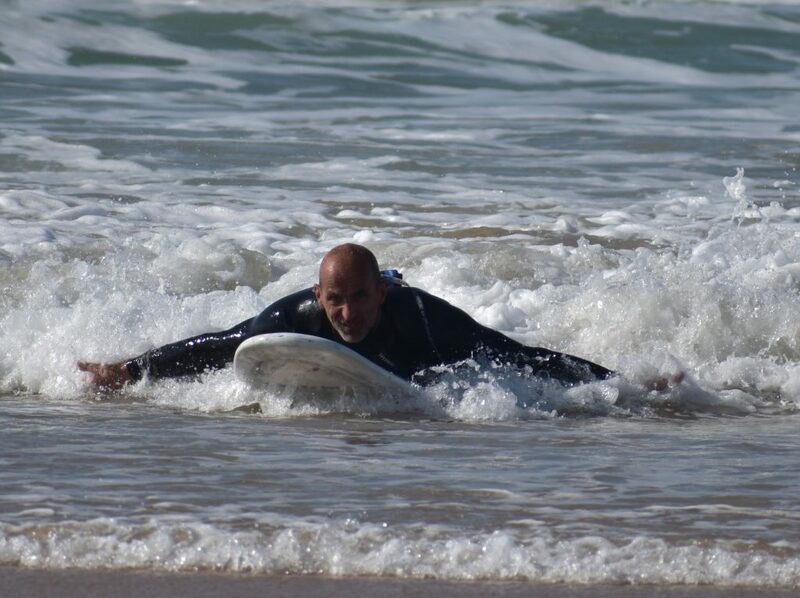 Lastly, the third difficulty of traditional surf is take off: quickly standing up on the board once it begins sliding the wave’s slope. 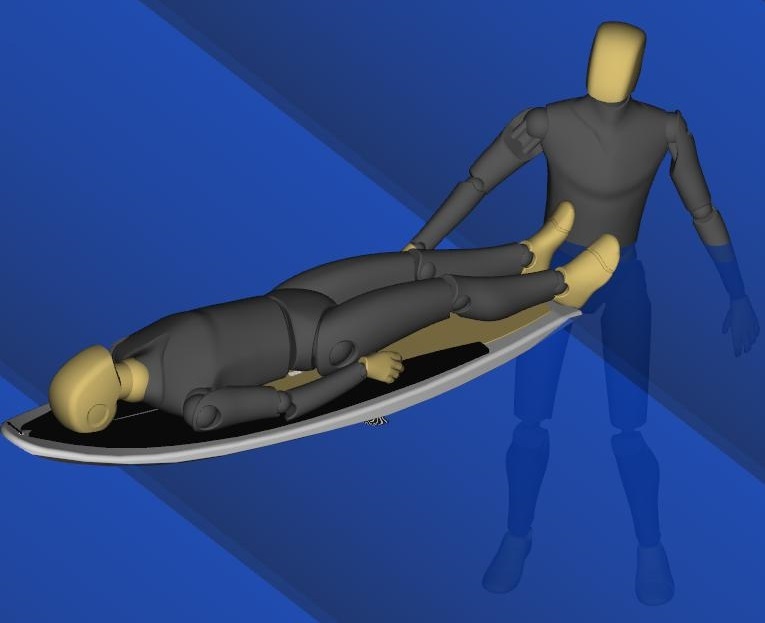 Introducing a new type of attached surfing, designed for an easier learning. 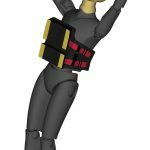 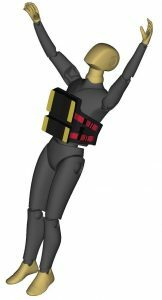 The harness also provides a buoyancy aid of 60 Newtons protecting against drowning risks. 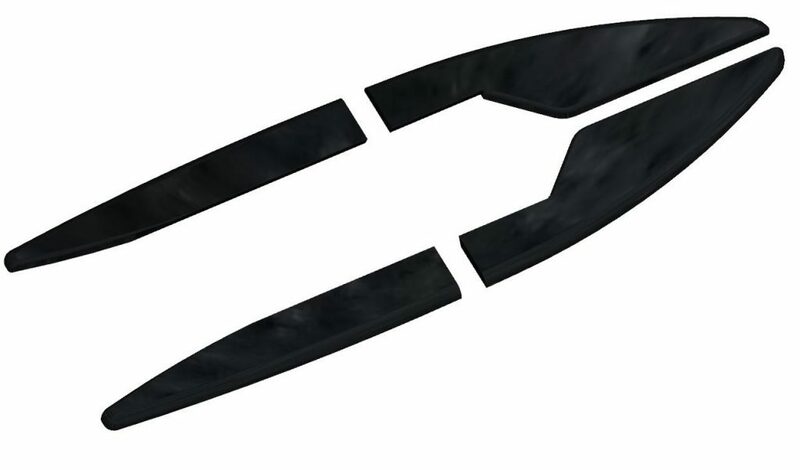 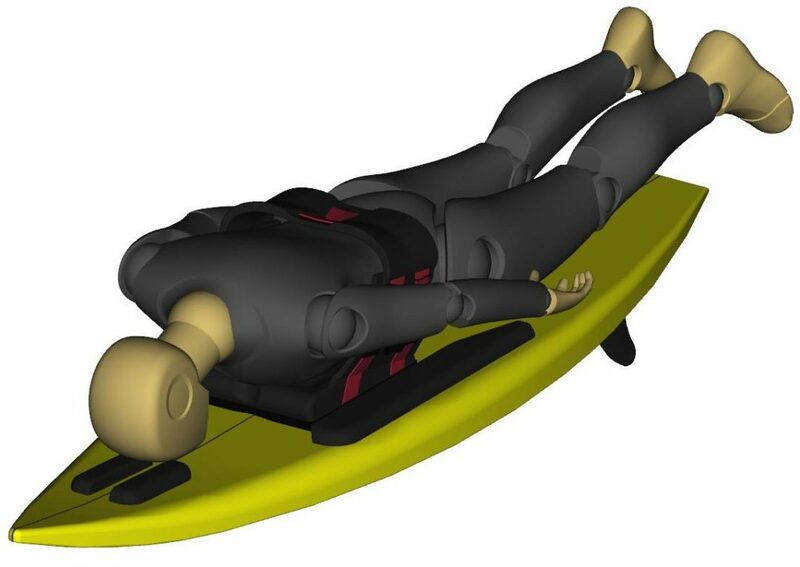 The board – harness coupling is done by a simple longitudinal translation from the tail to the nose of the board. 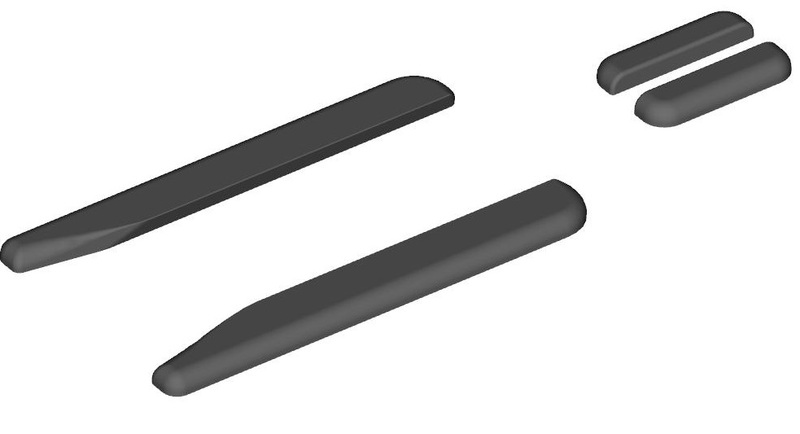 Think plugging a Lightning cable. 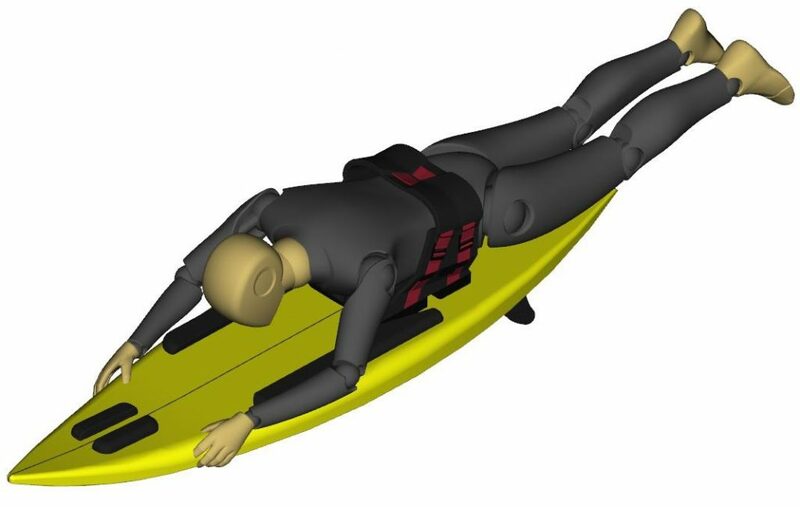 The sliding of the harness along the adaptative set guide rail allows the surfer to adopt a variety of linear positions on the board. 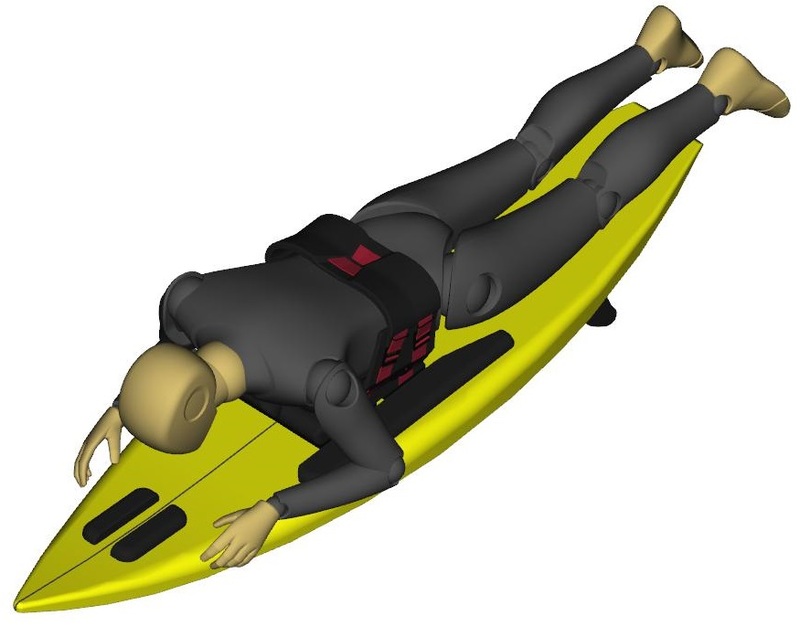 The Velto Surf System allows surfers to freely use their arms to paddle, move their center of gravity, exert pressure on the rails of the board to act as a rudder without slipping off the board. 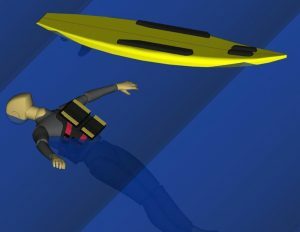 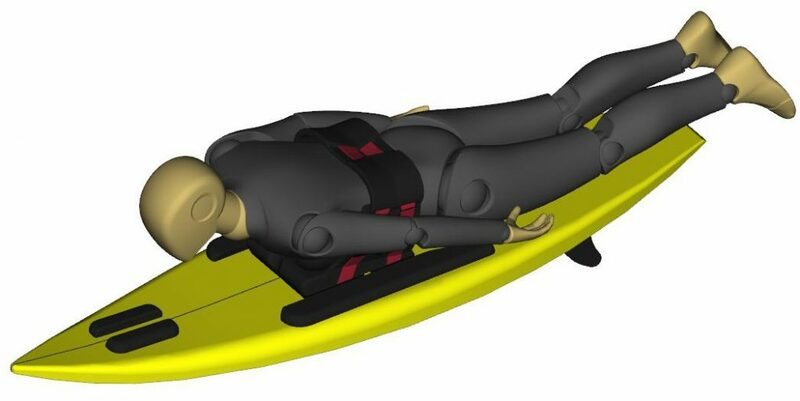 In case of falls, the surfer is quickly and automatically ejected from the board. 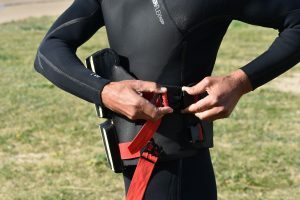 This sport can be initially practiced at low cost, by converting an a surfboard or even a windsurf board – dismantling the foot-straps and sanding down the anti-slip coat. 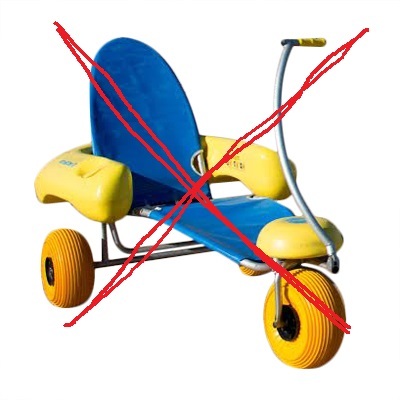 Installing the adaptative set is straightforward. 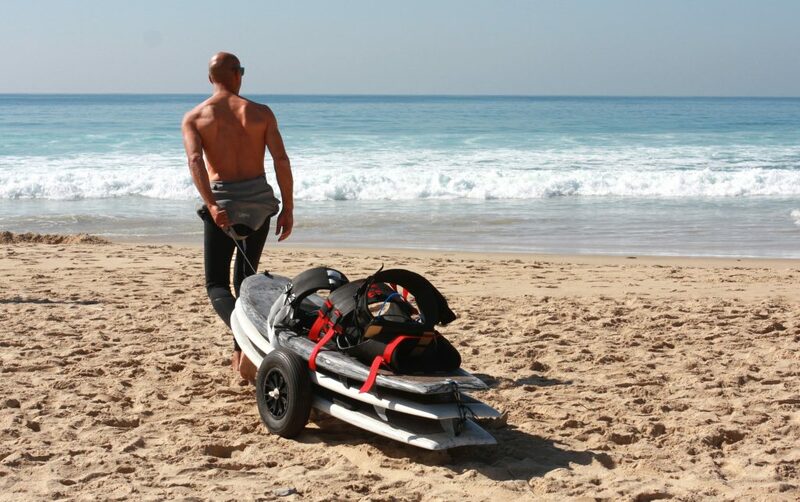 Velto Surf System offer a standard adaptative set and a luxury adaptative set with more protections depending on needs. 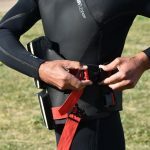 Velto Surf can be practiced on flat water – leisure or race mode – or in waves ranging from very small..
Velto Surf is ideal for learning surfing basics: synchronizing with the wave, positioning and trajectory. 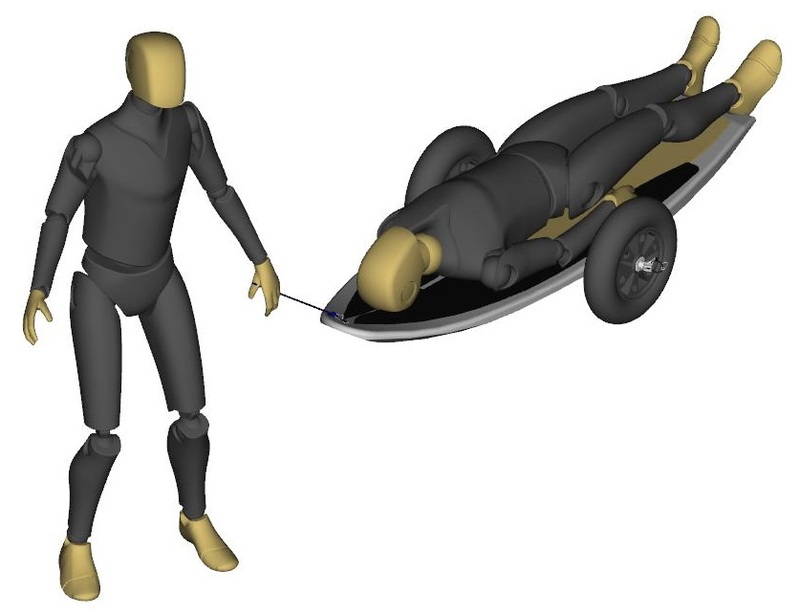 Then those who want to and are able to can leave the “pop-up” to a standing position. 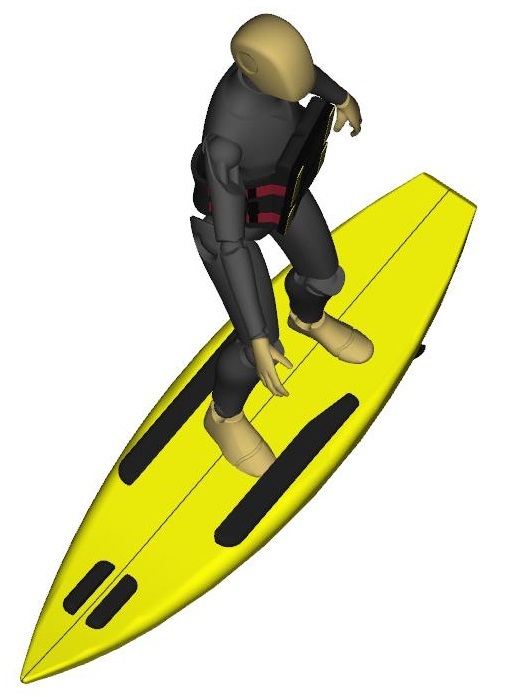 Velto Surf provides a lot of safety thanks to its buoyancy harness and foam head plus body protection. 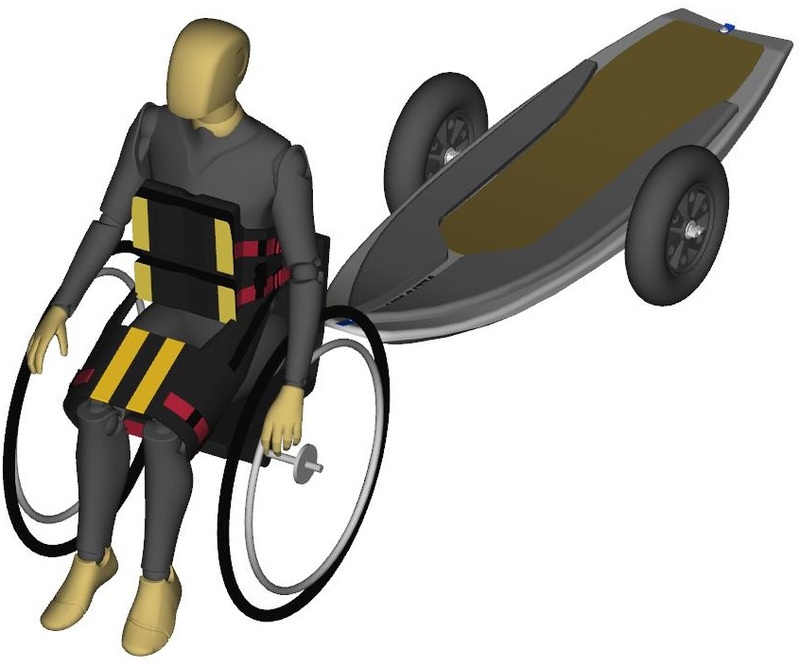 For paraplegics, a support to hold the legs in place on the line of symmetry of the board is available to be added to the harness. 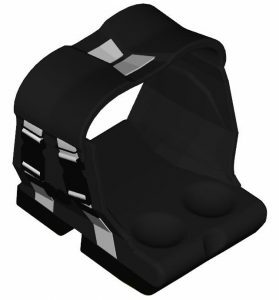 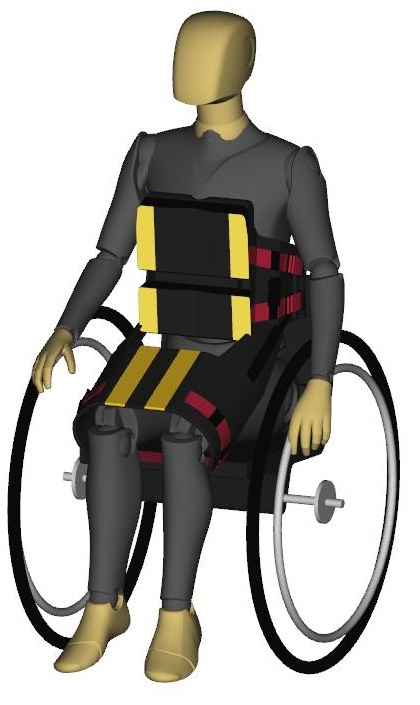 The harness and leg support can both be put on in a seated, lying or standing position. 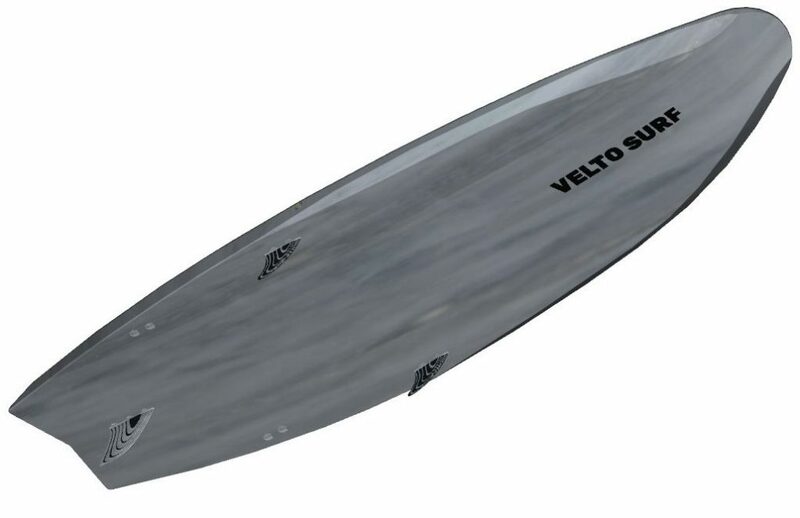 Velto Surf offers an exclusive board with a shape specially designed for the prone surfing position and also an easy stand surfing. 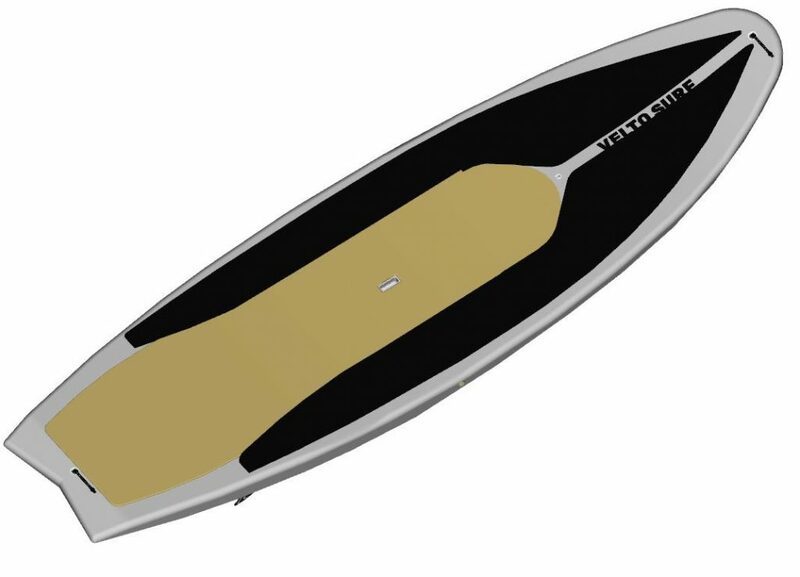 Technically, the Velto Exclusive Surfboard is made of a sandwich composite material – the same construction used by more expensive windsurf boards – giving it a greater resistance combined with a feather weight. 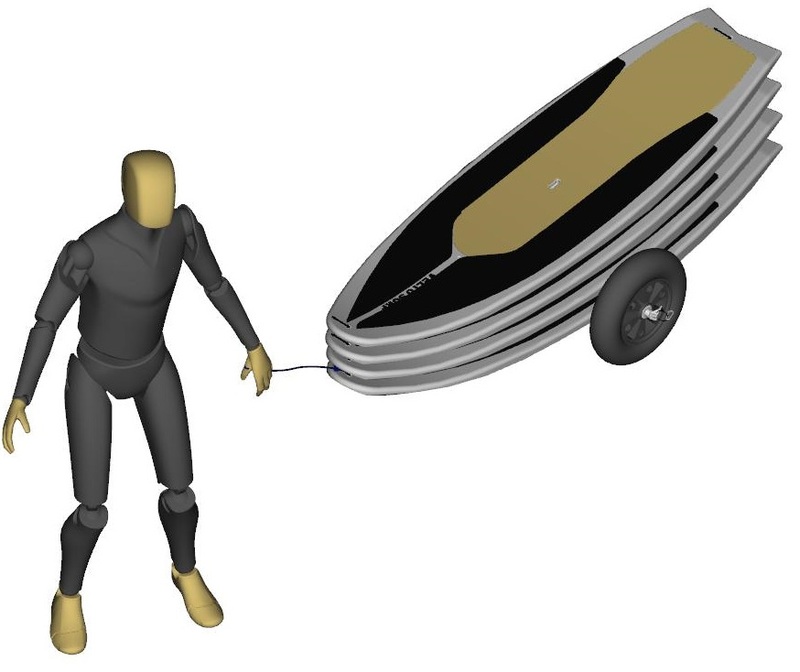 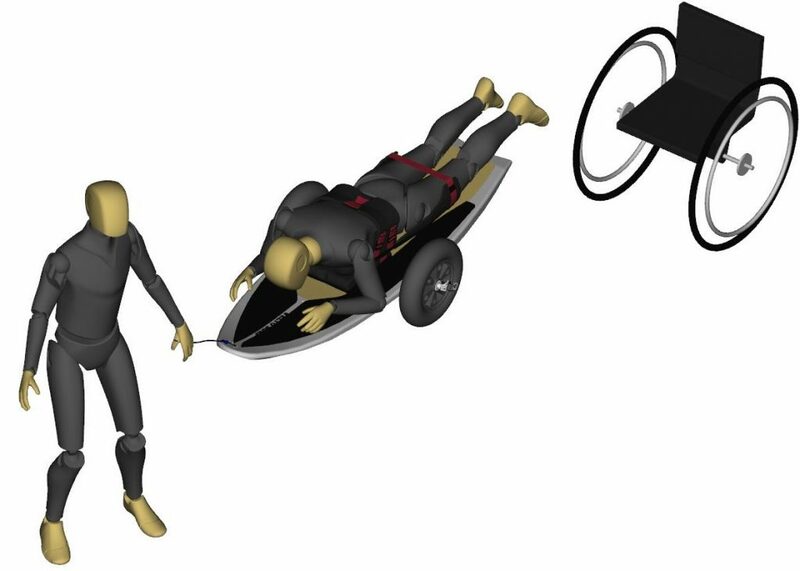 Velto Surf has also developed a way to allows paraplegics who wish to be more independent to move from their wheelchair to the water with less help. 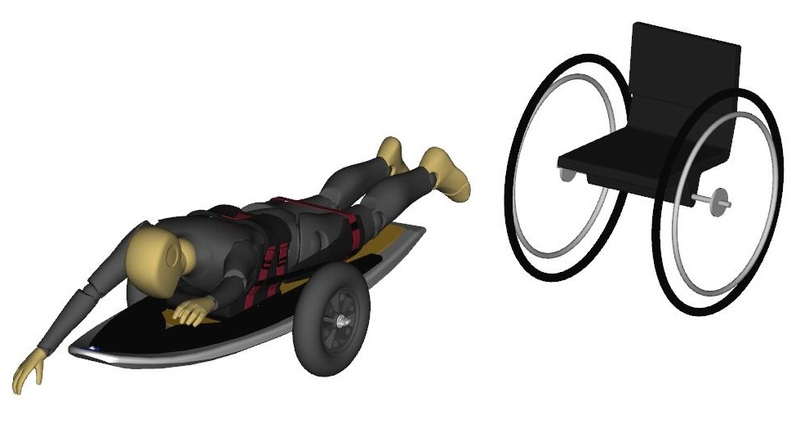 The two removable wheels placed at the centre of gravity help the surfer entering the water. 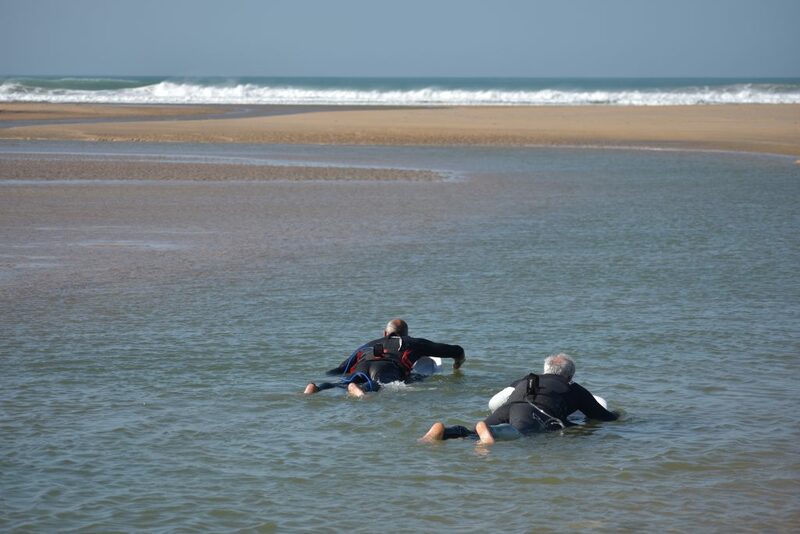 Once in the water, the surfer can remove the wheels and leave them to a friend. 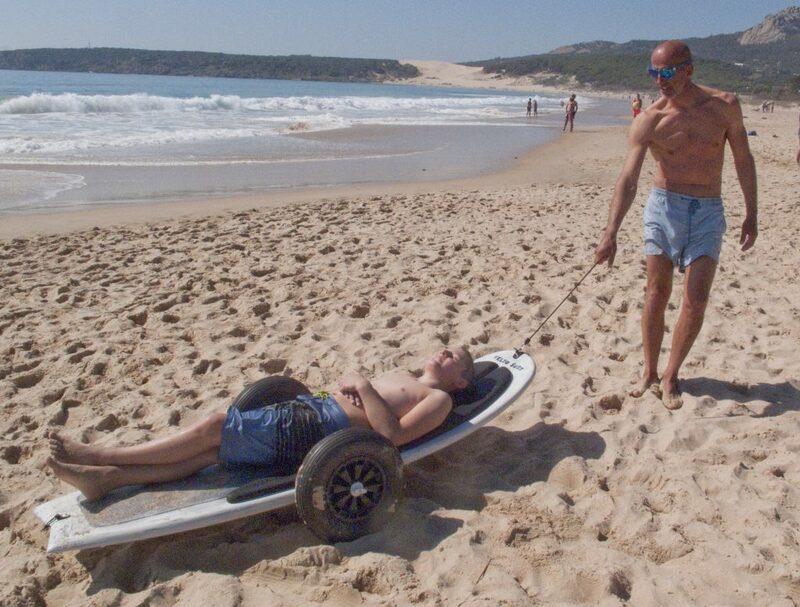 For surf schools, the Exclusive board with wheels is perfect to replace amphibious wheel chairs while also being several order less expensive and lighter. 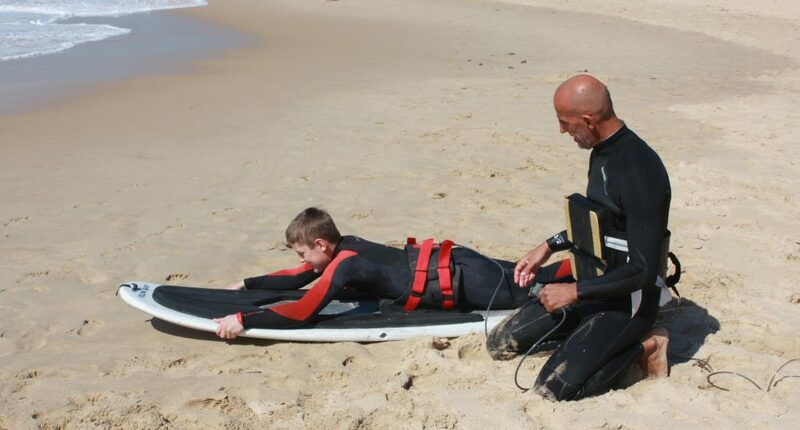 The wheel kit also makes it possible to use the board as a transport cart a particularly popular option with surf schools. 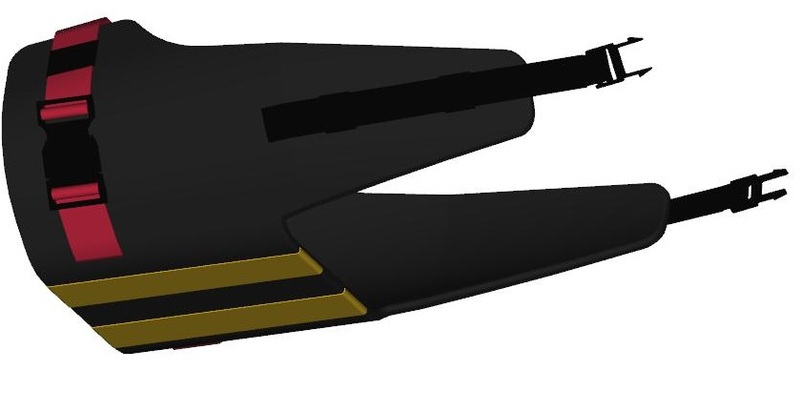 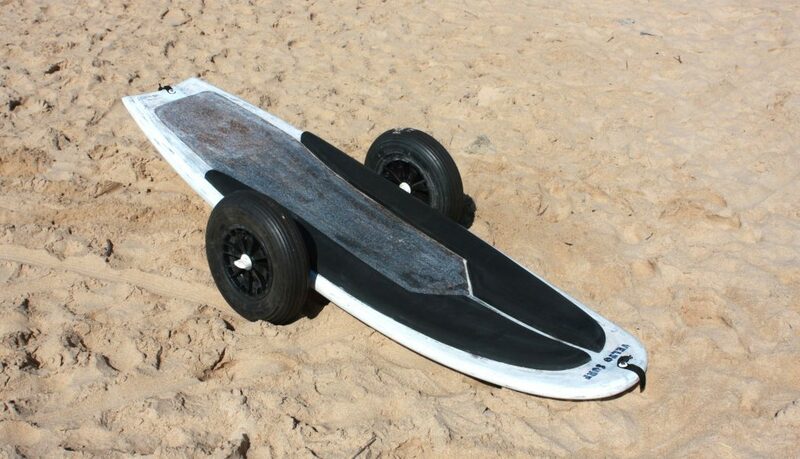 Thanks to its side foam and wheel kit, the Velto Exclusive Surfboard can be converted in a rescue board. 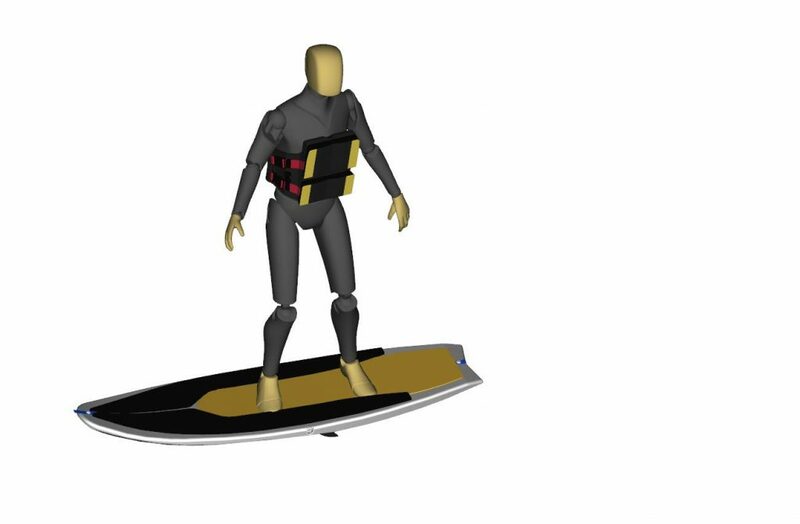 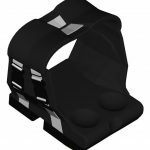 Velto Surf is designed to allow and even facilitate standing surfing, with or without the harness: foams help position the feet on the axis during the “stand up” . 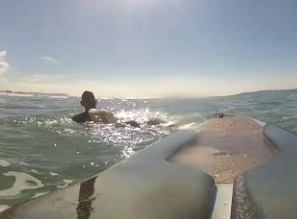 The same board is now suitable for the whole family. 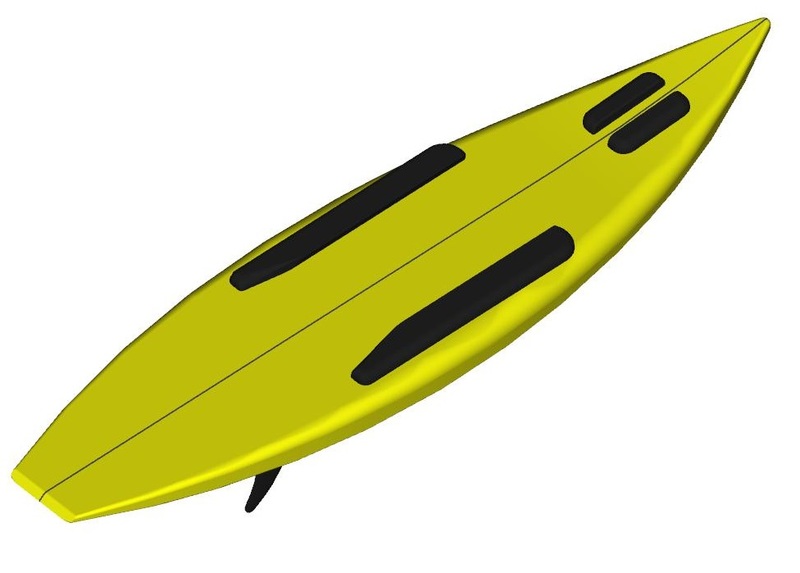 The Velto Exclusive Surfboard is designed to allow surfing the foam right to the sand thanks to its small fins – really appreciated by children. 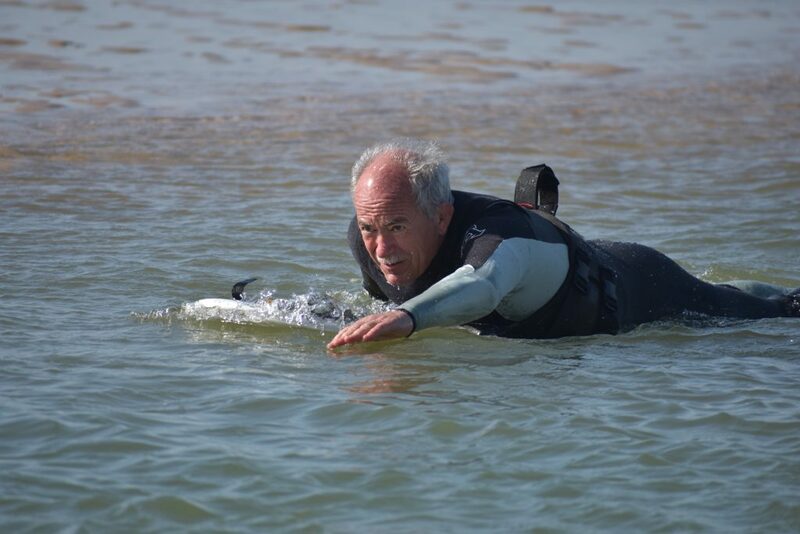 The feedback we saw is that Velto Surf is a nautical activity for all ages and all sea conditions, which could also prove particularly interesting for beachside resorts and holiday centers.